From a table in one of Ray Kurzweils power-point presentations. He´s a trustable guy with stats like these, and this is fairly consistent with all the simular estimates I´ve read on life expectancy. After googeling “life expectancy at birth 1900 US” I found several sites confirming the number, including this: http://www.infoplease.com/ipa/A0005140.html/. Notice that this is life expectancy at birth. Due to high mortality of young and newborn children this number does not represent the age you would expect to reach if you already had gotten past this stage, but it does say something about the standards of living back then compared to now. From Ray Kurzweil. 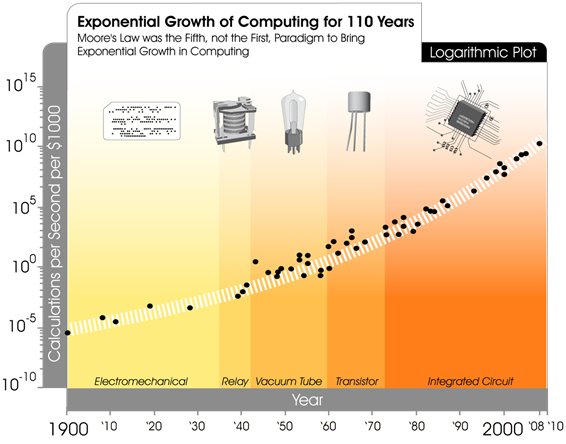 Here is an old version of one of his graphs that show the same thing (with a table, etc): http://www.singularity.com/charts/page67.html. Here is a newer version of this graph (bit without the table): https://howisearth.files.wordpress.com/2010/11/eksponensiell-forbedring-av-datamaskiner-i-108-ar-moores-lov-utvidet-fc3b8r-og-etter-silisium.png. And soon almost all indians will have one. This is estimated by African Infrastructure Country Diagnostic. I didn´t specify in the video that this was for the early 2000s, but there is no reason to assume (as far as I know) that this estimate would be any lower for the growth Africa has had more recently. Google it or check Wikipedia. But with the recent, and perhaps future, economic turmoil, it has to be said that this upward-pointing graph is bumpy. Look up the economic growth the continent Africa, and the great majority of its countries, has had in recent years. It´s common knowledge that the economies in most of Asia are growing. And look at the next fact. I´m sure finding the numbers this statement is based on wouldn´t be impossible either. One would have to look for PPP GDP per capita. I looked this up on WolframAlpha, as well as several tables that I found online. How much work on the average wage is needed to earn one hour of reading light? Matt Ridley did these estimates and write about them in The Rational Optimist. All these are are things I encourage you to look up. You will find much by looking up the theories of Ray Kurzweil (his books, his talks, etc). You are currently browsing the HowIsEarth.com blog archives for August, 2012.